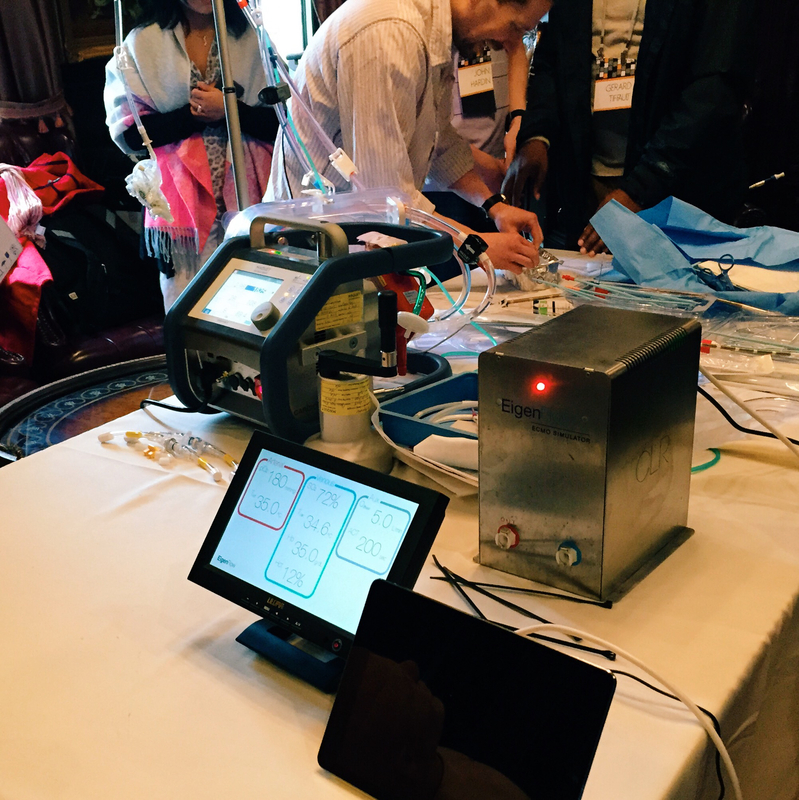 CLR was recently featured at CastleFest 2015, an ultrasound conference for ER physicians. We were invited by the hosts of the EDECMO Blog, Zack Shinar and Joe Bellezzo. 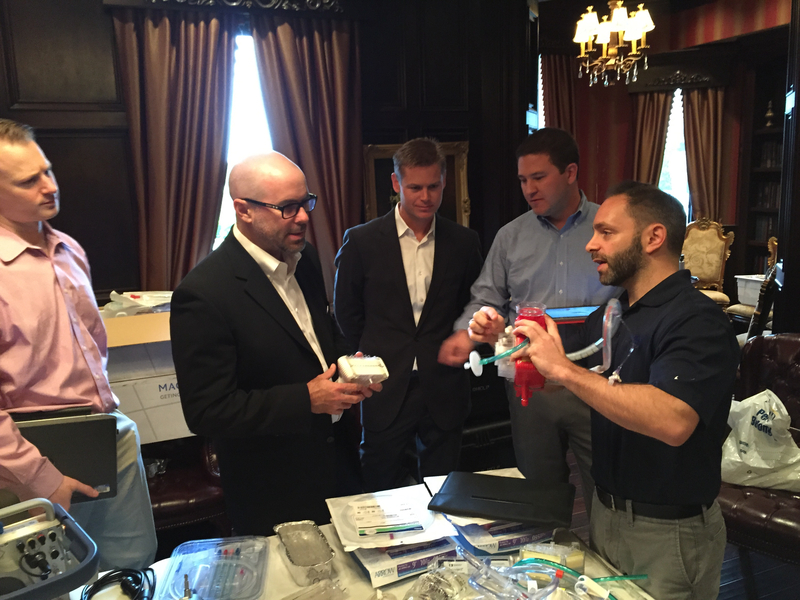 Joe and Zach talking to MAQUET sales reps about the redesigned oxygenator in the Cardiohelp™. A venous cannula is placed in the common femoral vein (drainage) and an arterial cannula is placed in the femoral artery (infusion). Ideally, the tip of the venous cannula is draining blood from the right atrial inlet, while the tip of the arterial cannula delivers blood to the iliac artery just below the renal arteries. Establishment of the circuit is therefore retrograde. CastleFest 2015 was held in the beautiful CastlePost of Versailles, Kentucky. What a great location! CastlePost is available for nightly accommodations, weddings, corporate events and personal occasions. On the drive there I encountered numerous horse farms encompassed with miles of winding black fences. Beautiful indeed. Once the conference began, Zack and Joe demonstrated how to cannulate for VA ECMO then explained how ECMO works and what to do if you run into problems. Working with MAQUET we were able to hook up an EigenFlow to one of their Cardiohelp™ and then used it to simulate low venous saturations, high PaO2 pressures, and longer Activated clotting times. 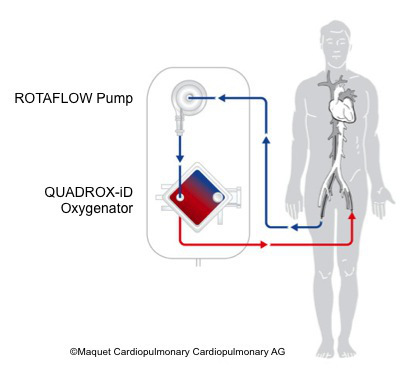 Onsite demonstration of EigenFlow connected to a MAQUET Cardiohelp™. ECPR is the future of resuscitation. Traditional CPR has a global 8% survival to discharge rate and is in desperate need of a new model. ELSO states that within the limited scope of ECPR, outcomes are about 30% survival to discharge1. Following research from Japan and Europe, I believe ECPR will be a future protocol that medical practitioners will stand behind in years to come. 1ELSO Registry, July 2011, http://www.elso.med.umich.edu.